Can't decide on what flowers you would like to send? You can't go wrong with this generous and colourful bundle of Chrysanthemums, Gerberas, Sims, Roses, Iris and more! With its diversity and exuberance, it is uniquely suited to the undecided.Lilies may be sent closed/partially closed in order to prevent damage and to last longer.Vase not included however; we suggest including a Premium Vase with your gift to make the overall impression a little more fancy. Most standard floral orders delivered to metropolitan areas have a reduced delivery charge of 12.95SGD. I have used your services for a number of years now and every order has been received with great delight. Promptness and efficiency cannot be surpassed. 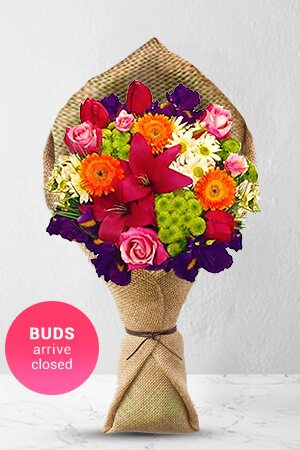 Delivery was speedy and flower bright and gorgeous as ordered. My neice [new mum] was delighted. The experience was trouble free and easy. Keeping the order details from last year is an excellent service.